When shopping for new appliances, there are two government sponsored labeling programs designed to help you find the most energy efficient, environmentally friendly options. Knowing what these labels mean and how to use them can enable you to make intelligent appliance purchases. 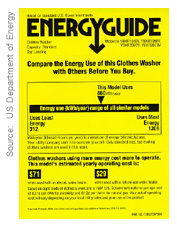 The bright yellow EnergyGuide labels are required by the US Department of Energy (DOE) to display the appliance's estimated energy consumption and estimated annual operating costs based on national average energy costs. Federal law requires they be placed on all new appliances that have a fairly wide range of energy efficiencies between models, including refrigerators, freezers, water heaters, dishwashers, clothes washers, central air conditioners, heat pumps, furnaces and boilers. Appliances having little difference in efficiency between models, such as kitchen ranges, clothes dryers, and microwave ovens, are exempt. These prominent and easy-to-understand labels make it simple to compare the cost-to-operate of different models and make informed purchase decisions. Let's say you are shopping for a new refrigerator and you've narrowed the field to just two models that have all the storage space and features you want. If both models cost roughly the same amount, the EnergyGuide labels can give you the critical information you need to make a good investment decision between the two. If one costs $68/year and the other costs $88/ year, you now have to decide if the "more expensive to operate" model is really worth and extra $20 dollars per year cost to operate. And keep in mind, that's every year, so the extra cost or savings can really add up. The other label you'll likely see as you shop for new appliances is the Energy Star® label, sometimes referred to as the government's seal of approval. Its purpose is to help buyers identify appliances with higher energy efficiency. The Energy Star® program was launched back in 1992 by the US Environmental Protection Agency (EPA) to help consumers protect the environment by purchasing appliances with higher energy efficiency. Unlike DOE's mandated EnergyGuide program, Energy Star® is a voluntary labeling program. It is designed to help shoppers identify more energy-efficient products with the ultimate intent of reducing greenhouse gas emissions from power plants. Energy Star® R-labeled appliances exceed federal efficiency standards often by 15%, and as much as 110% for some appliances. Buyers can be assured that a labeled appliance will have a lower cost of operation over its life than some other models.